I can never make my mind up about what level of coverage and finish I want from my foundations. Some days I want something completely full coverage that will make my skin look flawless, and other days, I really want my skin to look like my own skin but a little bit better. My skin changes every time the weather does and this leads me to continue (what feels like) a lifelong mission to find the perfect foundation and I know I'm not the only one! We always seem to think the grass could be greener but I keep coming back to these three foundations, which are not only fantastic for all year round, but they all lend themselves particularly well to Spring/Summer makeup looks. Whether you follow the meteorological or astronomical seasons, there is no doubt that Spring is either here already or just around the corner (finally! ), so I thought it was a good time to share these beauties! NARS Sheer Glow Foundation is a dream as it gives the most gorgeously radiant satin finish, which is perfect for summer! It's hydrating, which is so important in the warmer months as your skin is battling with changes in temperature, including air conditioning. NARS even claim that this foundation will improve your skin's brightness and texture if used daily due to the anti-oxidants and turmeric extract it contains. Sheer Glow is available in 19 shades, but I would recommend trying in-store rather than buying online as some of the shades seem to be in a strange order. For example, Light 6 (Ceylon) should be darker than Light 5 (Fiji) if you use their guide, but in fact when swatched it's the opposite! 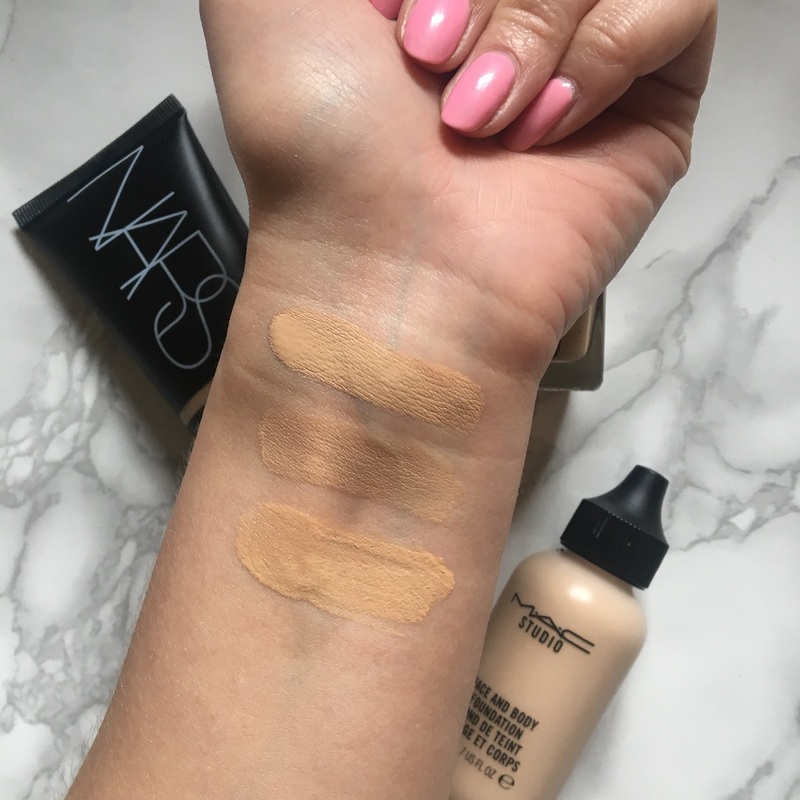 Nars recommend warming the foundation in the hands and applying with fingers so that the foundation can really melt in to the skin, but I think the foundation works just as well with a beauty blender, although obviously there is some wasted product with this method. This foundation is recommended for normal, normal-dry and dry skin types so I wouldn't suggest it for oily skin as it is a hydrating foundation. The only negatives are that a pump isn't included (you can purchase one separately for £3), it does oxidise so be aware that it might suit you to order a lighter shade, and it doesn't contain any SPF. MAC's Face & Body Foundation is a very sheer foundation, which feels moisturising and lightweight on the skin, making it perfect for a fresh and natural summer makeup look. Although this foundation is low coverage, it is definitely buildable and leaves a really lovely natural skin-like finish. Even close up, this foundation is barely visible and blends seamlessly into the skin. 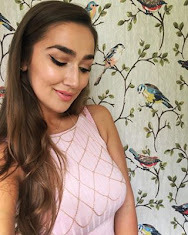 My favourite way to use this foundation is to apply over my entire face using my fingers (brushes and beauty blenders soak it up due to it's thin consistency), then I precisely conceal any blemishes using a high coverage concealer, which gives the extra coverage where I need it, without losing the 'my skin but better' look. I also love to mix it with heavier coverage foundations to create a custom coverage. There are 13 shades available and my pictured shade is C1 (the lightest yellow toned shade) but I am closer to C2 at the moment. You can also get a larger version of this (120ml) for just £29.50 so if you like it, it's definitely worth getting the larger size. I find MAC to be really good with giving samples of foundations so don't be afraid to ask for a pot of it so you try it out at home! I always do this as I like to apply a foundation myself so I can see how it lasts and gives me the chance to see it in natural light. I never trust department store lighting! Don't let the fact that this is called a 'tinted moisturiser' put you off, because it actually gives more coverage then MAC's Face and Body, which is why I've included it in this foundation post. It gives more coverage than any tinted moisturiser I've tried and glides beautifully on to the skin. This product is fantastic for wearing during the day in the Summer due it's SPF30 protection and it's also infused with naturally derived botanicals and ingredients that hydrate your skin. NARS claim that this product can also reduce the appearance of hyper pigmentation and dark spots. 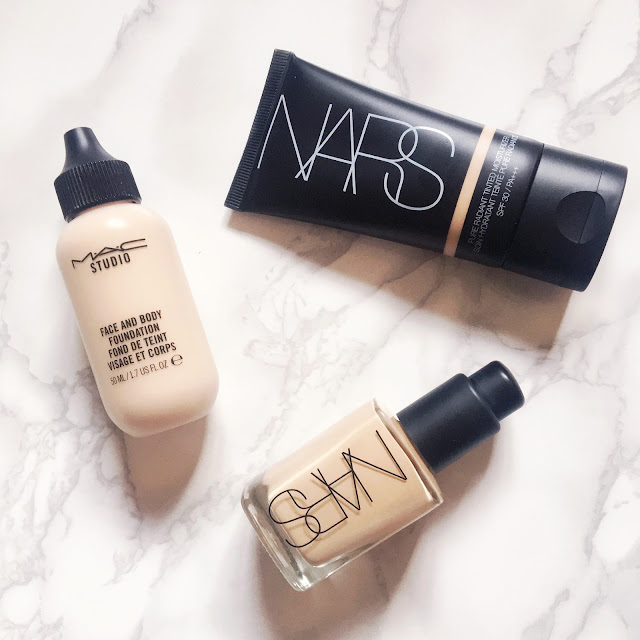 I love how NARS combine skincare into their foundations, so not only does the foundation make your skin look great instantly, but it should help your skin to look better without makeup too! (Top-bottom): Nars Sheer Glow (Fiji), MAC Face and Body (C1) & Nars Tinted Moisturiser (Alaska). Have you tried any of these foundations? What do you think? Have you found anything that prevents the NARS products from oxidising?